Oberammergau Passion Play in 2010. 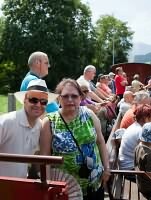 We went on a packaged tour to see the Oberammergau Passion Play the summer of 2010. This wasn't a run-of-the-mill package tour, it was more of a pilgrimage tour arranged by the catholic church in Porsgrunn, and orchestrated by Ellen, and Gunnar of Vadstena in Sweden. The bus we used was chartered from Vadstena, and was driven by Johan. The trip started on a saturday early in the morning from Larvik. We had to go to Larvik on friday evening, and stay the night at a hotel there. The bus we would use on the trip came from Vadstena in Sweeden, and had to pass through Oslo, so we were picked up there and dropped at our hotel in Larvik. We needed dinner of course, and went for chinese at a restaurant nearby. The helpings here were huge, and the bowl of Peking soup wasn't full until it was full. The first day we were picked up at 7 am, and went on to the ferry to Hirtshals in Denmark. The trip lasted 3 hours 45 minutes, during which time we enjoyed a breakfast buffet on board. Our first hotel was in Hamburg, and the name was a source of mirth, as it was called 'Seniorenresidenz Bad Bramstedt'. There was more than enough gray hair in our party to make that a very apt name. The second day brought us to Nürnberg. The lunch stop was at a restaurant where GI and I had a football-VM 'hacksteak' special dish - it was the last day they would serve this. The lunch stops would be scheduled to 45 minutes, but getting and eating lunch (not to mention going to the toilets) for 40+ persons takes time, and we were seldom ready to drive again after only 45 minutes. That evening we went to Gnadenberg to look at the ruins of a Birgitta monastery. We started with a mass that Fr. Frode held in the church built in conjunction with the ruins, and then we had a look around the ruins. Afterwards we had dinner at Gasthof zum Kloster, where Liv Elisabeth was wished a happy birthday. The weather forecast for the week had been bleak, with mostly overcast and much rain. Fortunately that prediction was not accurate at all, but that presented other problems. The weather was mostly sunny with temperatures reaching 35 °C most days, occasionally reaching 37 °C. That also meant that the nights were warm, and with no air conditioning (not even electric fans) in any of the hotels we stayed at, we soon learnt to sleep with little or no clothes. 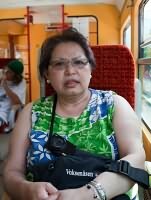 Since we would travel in our bus for many days, we swapped seats every day. Each morning everybody would move 2 rows forward in the bus, and the ones in the two front-most rows would move to the back. That way everybody would get to sit up front, where the view was good (but the air conditioning less so), and further back where the view was less but the temperature more comfortable. 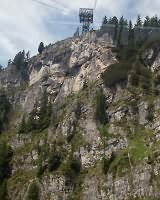 We were now getting close to Zillertal in Austria, where we would spend 4 nights. Close by is the Swarovski factory in Wattens, with a crystal museum that we visited. There was of course a 'factory outlet', where we could buy crystals of all sizes and prices. GI was able to buy some bracelets that were half price. Later on, at a Swarowski store in Innsbruck, she found the same kind of bracelets at 4 times the price she had paid. The Swarovski Crystal Worlds were founded in 1995 on the occasion of the 100-years’ jubilee. A monster crystal was created that was 40 cm in diameter, with 100 facets, to represent the 100 years. We finally arrived at the hotel in Stumm in Zillertal, Austria, where we stayed for 4 nights. No more packing and unpacking and schlepping heavy suitcases in and out of the bus. We had a nice room at Hotel Pinzger. In addition to the bedroom, it had a entrance hall, and the bathroom had both a shower stall and a jacuzzi. The local church was literally across the street from the hotel. Fr. Frode held morning masses there each day when possible as long as we stayed in Stumm. The graveyards surrounded the churches in the area. They were very well tended, the locals would pass by the church on their way to work and water the flowers, and perhaps trim them too. The fourth day had no program. It was a day of rest for Johan, our bus driver, so we had to go out and find our own entertainment. Fr. Frode, GI and I went out to see how we could get to Mayrhofen. At the train station we had the choice of either steam train, or diesel train. The steam train runs only twice a day, and it was due after only a little wait, so we decided to take the steam train to Mayrhofen, and the diesel train back. The train had both open and closed cars. GI elected to stay in a closed car, while Fr. Frode and I stayed in an open car. That was a rather mixed pleasure, as the smoke from the steam engine was both black and smelly. Every so often a rain of soot would settle on us, and with my arms covered with sun block, the particles stuck. A kid in the open car lost his cap overboard, but he was lucky that we were just pulling in to a station. A bicyclist had picked up the hat and came to the station with it and gave it back to the kid. Our goal in Mayrhofen was the Mayrhofner Bergbahnen going up on Penken. GI elected to stay in town and sample the shops, while Fr. Frode and I went up. Inge and Anna rode up in the same gondola as we did. In the evening we went to a Tirol show nearby. It was hosted in a western type of show area, and was in fact quite strange. Most of us went back to the hotel after a couple of hours. This day started slow. We went for some lazy sightseeing in Stumm, bought ourselves some lunch in the local supermarket, and ate it in our hotel room. As always we were impressed with how neat everything was, and how much flowers there were everywhere. Our sightseeing this day was in Innsbruck. We had a finnish guide (speaking swedish), and were guided around starting at the Golden Roof. It was another very hot day, and GI refreshed herself at one of the fountains. We visited Dom St. Jakob - St. James's Cathedral. We started this day with a visit to Linderhof Palace. We were a little early for our time slot for sight-seeing, so we used the opportunity to make a group picture. Photographing was not permitted inside, so I had to content myself with pictures of the surroundings. After the tour, those of us with a little stamina walked up to the Venus Grotto, an artificial cave. Next on the program was Ettal Abbey. The daily services were conducted in a small modern chapel built next to the church. 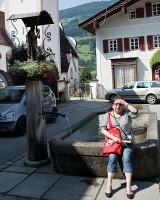 In the afternoon, we went to Oberammergau, so that we could see the 'outside' of the passion play. There were a huge number of actors in the play, and when they were not on stage, they would relax outside. The 'pre-visit' allowed us to see this informal part of the play. Of course we visited the parish church in Oberammergau. A pleasant surprise awaited us when we got back to the bus after sightseeing. Gunnar was serving wine and Irish coffe to anybody that wanted. Finally the day of the Passion Play has arrived. We first went to the hotel we would stay the next night. 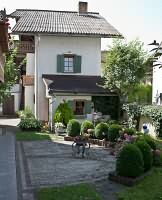 It was in a neighbour town, Bad Bayersoien. Before going back to Oberammergau, we had lunch in a pleasant outdoor setting. The play lasted for 6 hours, not including the 3 hour dinner break. During this break, we went for more sightseeing after having dinner. Oberammergau is famous for its "Lüftlmalerei," or frescoes, of traditional Bavarian themes, fairy tales, or religious scenes found on many homes and buildings. After a long day in the bus, we arrived at our hotel near Hamburg. Everybody had contributed to a gift to our most important persons that made this into an enjoyable trip. Fr. Frode, Ellen and Johan had each selected wood carvings that they liked in Oberammergau, and these gifts were presented to them after dinner. Another long day in the bus. We had to hurry to be sure that we would catch the ferry going to Kristiansand. Fr. Frode is the parish priest there, so he was set off at his church. From there, we had another 4 hours bus ride with stops at Porsgrunn and Larvik before we arrived in Oslo. This last day was in fact so long, that the bus, which would continue to Vadstena in Sweden, had an extra driver this day. 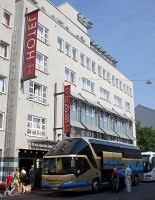 The driver had come to the hotel in Hamburg the day before.